The Annual General Meeting of the German Australian Business Council e.V. 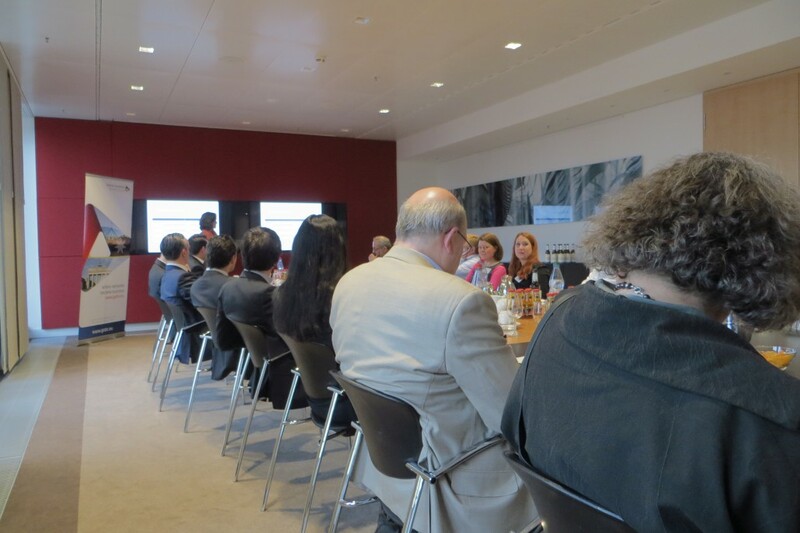 was held at the offices of King & Wood Mallesons on Monday 13th April. The mild weather allowed us to start the evening with light refreshments on the balcony with views over the Alte Oper and An der Welle. The Chair of the Board, Sabine Pittrof gave an overview of 2014 and an outlook of what is to come in 2015. The presentation focused on the rebranding from Australian Business in Europe (Germany) to the German Australian Business Council, the changes in the office administrators and events. Sabine thanked Susanne Schnack for her contribution to setting up the office and wished her well in her new employment. Eleanor Stephen is currently holding the seat in the office. Sabine also provided an overview of the global organisation and upcoming events for the combined “ABIE’s”. Eberhard Goihl, Treasurer of the German Australian Business Council, outlined the current financial status and highlighted some of the challenges we have been facing with invoicing, event payments and the data base. There has been improvement over the past twelve months due to the work of the office administrator. Eberhard also thanked Werner Waldner for his time in checking the books and approving the work completed over the past 12 months. Discussion did take place regarding invoicing and payment methods, the ongoing ties between the parent group Australian Business in Europe and the German Australian Business Council, Event funding and payments and the use of social media to grow and promote the organisation. We would like to extend our sincere thanks to King & Wood Mallesons for providing an excellent venue for the event and their warm and generous welcome and hospitality.